We drove for miles – our faces tight with sea salt, our shoes full of sand – looking for figs. ‘This used to be marshland‘ I was told. ‘Uninhabitable and shrouded with mal aria (bad air) until Mussolini herded down thousand of workers from the north of Italy to bonificare or make good the land‘. Now the air smells of late summer, of sea and buffaloes. At least it did on Saturday as we scuttled along in the panda. ‘Buffalo, cow, mucca‘ Luca squealed as we passed another mudbath enclosure in which barely discernible black, horned creatures wallowed. Creatures whose rich morning milk would provide our supper, this is, after all, the land of mozzarella di Bufala. We flew past signs for Sabaudia, San Felice Circeo, Terracina; seaside towns punctuating the coast between Rome and Naples. ‘Figs.‘ An emergency foraging inversion was undertaken so we could pull up alongside the tree, and a fence. A woman lurking on the others side looked over, eyes narrow. ‘I thought the tree was on the road‘ I said as we pulled away. Then I ate my stolen fig, a drop of nectar at it’s eye, its flesh tasting somewhere between honey, sweet wine and ripe berries. ‘Buffalo’ said Luca. We drove some more, passing dozens of fig trees, their branches heavy with fruit, all behind fences of varying degrees of seriousness. More signs for Terracina, Sabaudia, San Felice Circeo, another field of wallowing buffaloes. It was all beginning to feel a little like dejavu. Which of course it was! We had been here before, fifteen minutes before. We were driving in circles. Maybe everyone was right, maybe I had imagined the roadside figs. ‘Figs.’ This time there was no doubting the liberty of the tree. Nor its precarious position. Not that a bracken filled gully was about to stop me. I straddled the gap while wishing I was wearing trousers and had done some sort of stretching these last eight years. I grabbed a branch and tugged it down. Figs, dozens of them. Pause. Dozens of figs the size of grapes and as hard as acorns. At which point I let the branch ping upwards and admitted defeat. ‘I don’t understand, the trees in the gardens are full of ripe fruit!’ The stench of beast whipped through the car window and up our noses. ‘Buffalo’ said Luca. We pulled into a lay by farm shop-of-sorts, which rubbed salt into my failure. 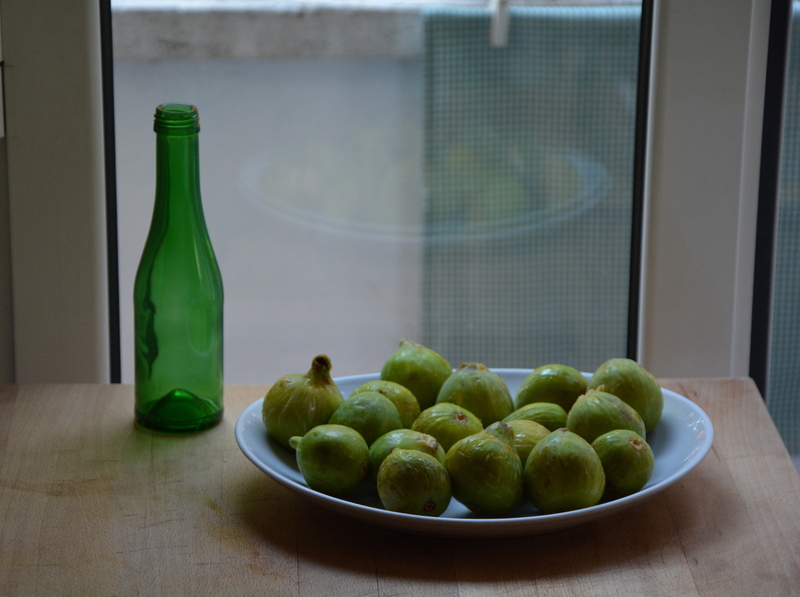 As she wrapped two trays of pale green figs and a bag of deep purple plums the woman told us it’s been a strange year for figs, what with the rain, which made me feel slightly better. Half one tray was eaten on the way back to Rome, washed with bottled water out of the window while waiting in traffic just south of Pomezia. The other half was eaten the next day for lunch, with prosciutto, a superb combination of sweet and salty, soft and resistant. 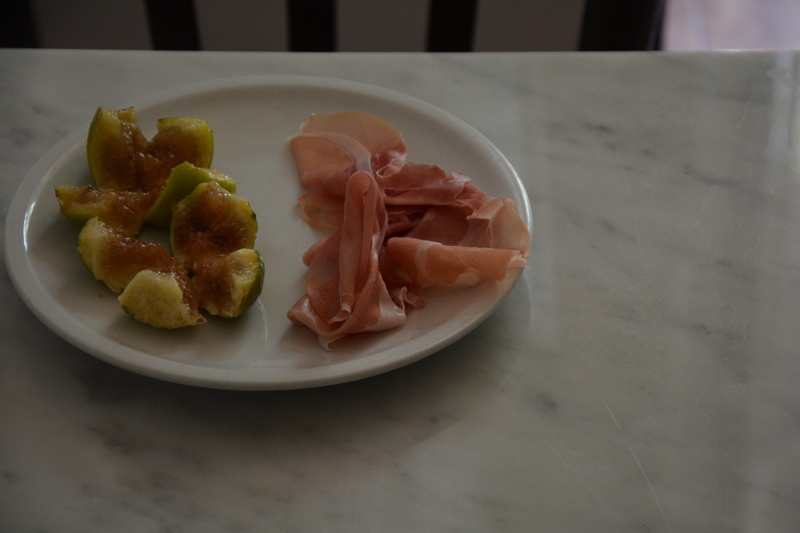 I started the second tray of figs at about 5 0 clock, with the last slice of prosciutto and a square of pizza bianca. Pizza bianca: a soft foccacia-like flat bread brushed with olive oil and strewn with salt that’s made in every breadshop, baker and pizza-by-the-slice establishment in the city, is an icon of Roman food so beloved by Romans it makes me jealous. At this time of year, when figs are ripe but sodi, vinous and sweet, Romans tear and tuck them along with a slice or two of prosciutto between the two ripped halves of pizza bianca. The salty prosciutto contrasts deliciously with the sweet, floral fig, the seeds grate gratifyingly against the smooth meat and get caught in your teeth, the pizza acts as slightly crisp, oiled and salted pillow enveloping everything. Tasty and good. As is this tart, for which I used the last six figs. An almond and fig tart, a frangipane of sorts based on the River Cafe pear and almond tart on page 282 of the blue book I have been meaning to make for at least 15 years. Unlike my Granny Alice and Mum, I am not a natural pastry maker. I’m afraid you see, of puffing up and shrinking down, of cracked crusts and soggy bottoms. Especially soggy bottoms, as there has been quite enough of those these last two years. I like tarts though, and like is more powerful than fear. So with cold hands I rub cold butter into flour until it looks like fine breadcrumbs, then add some sugar – not too much as the filling will be sweet enough – then a whole egg and a yolk for good measure, bring everything together and then leave it to rest in the fridge. 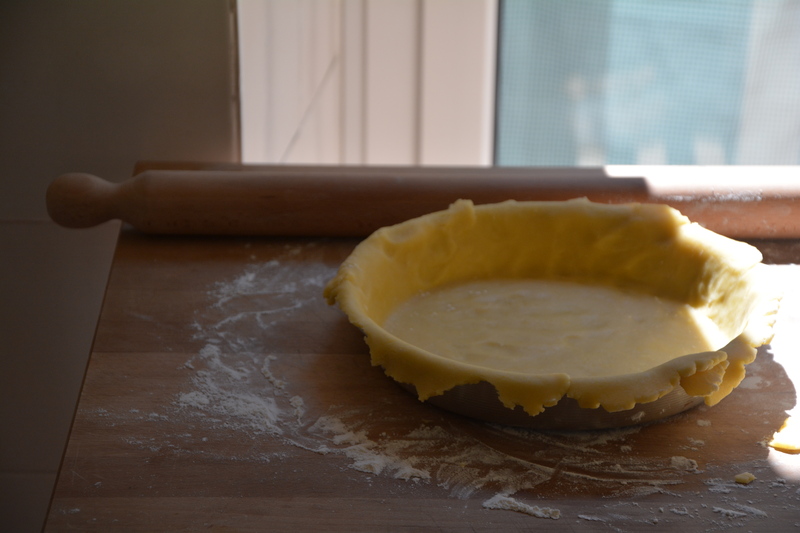 Once the pastry is cold you roll it into a circle bigger than the tin – overlap is important – then maneuver it into the tin, patching and pressing as you go. Then you bake this scraggy-edged tart case, with or without baking beans (I prefer without, the sticking is another anxiety I’d rather avoid) until its pale gold or the colour of a rich tea biscuit. You can neaten the tart case if you like, by breaking off the scraggy edge, or you can leave it just so. Then you fill the tart case with a coarse ivory coloured-cream of ground almonds, butter, mascarpone, sugar and egg. To finish, you stud the cream with halved figs. The tart needs at least 45 minutes in a low oven. 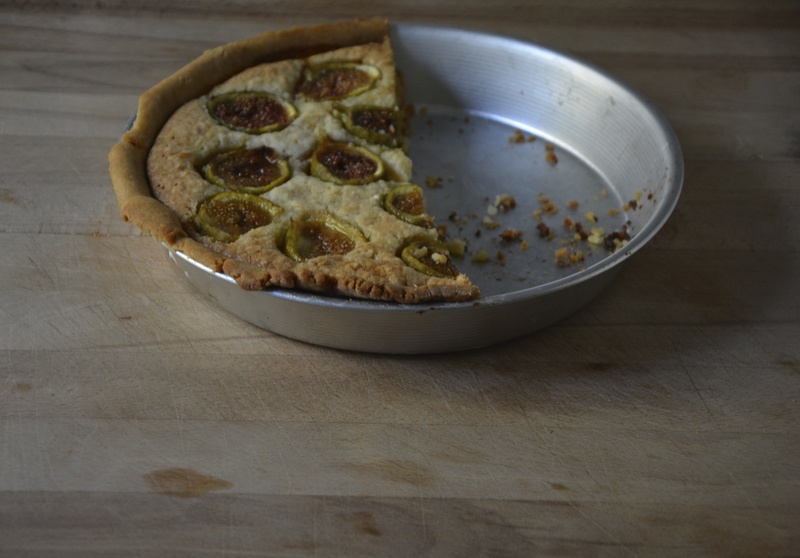 My tart was deeper than it should have been, so it took an hour and five minutes at 160° for the filling to set into a soft, crumbling marzipan-like affair with a golden crust, and the figs to wrinkle into even sweeter, chewier things the colour of Chianti. A damp, dense, richly flavored tart – figs and almonds have a nougat-like quality when combined – that manages to be both homely and exotic, here and there – wherever there may be. Even better the next day and mauybe even better the day after that. Serve in smallish slices with unsweetened espessso, black tea or a dry dessert wine. Adapted from recipe for pear and almond tart in The River Cafe Cook Book. On a floured board roll the dough into a round at least an inch larger than your tin. Using the rolling-pin, maneuver the dough into the tin and then press it down carefully, patching any cracks. Leave the overhang. Bake blind for 20 minutes until very light brown. Reduce the oven to 160° / 300 f.
While the tart case cools a make the filling by mixing together the butter, mascarpone, sugar, almonds and eggs. Spoon this cream into the tart case, smooth it out a little with a fork and then stud the cream with fig halves – seeds to the sky. Bake the tart for 45 – minutes to an hour or until the filling has set firm and has a nice, golden crust and the figs are wrinkled and dark red. Rachel, that Fig hunt sounds like exactly the kind of thing I would do! It is a bit of an anti climax having to buy them instead of picking them but at least you got some lovelies in the end. Beautifully written as always. It was, I felt my fig failure deeply. Next year. Oh and thank you. Just barely managed to find some “verdini” for my daughter before she left to return home but am hopeful September will bring in some more. Your photos and recipes and stories are such a treat! Thank you. I’m sure you heard of the Italian saying “non è mica pizza e fichi”, right? 🙂 Prosciutto, pizza bianca and figs, paradise. Will definitely try the fig tart. Loving the figs coming to market now but can’tt taste quite the same as yours fresh from the tree. I like your little fig-hunting adventure although I hear your pain in eventually having to give up and buy figs. Although this is the first summer I am living in Rome I had a feeling it was an odd year for figs – thanks to monthly trips to Italy over the past 5 years or so and various summer vacations I have become used to this glut of fresh and ripe figs come late summer, whether in supermarkets, at the market or indeed weighing down the branches of roadside trees. This year it feels like there are no figs at all – there was one measly basket at the supermarket the other day and, alas, the birds got to a family friend’s tree before the figs were even fully ripe. I do hope I will get my hands on some nice figs before the season is well and truly over but I am not counting on it! Oh well you tried.. the bought figs sound delicious though and the pie looks fab, lovely looking pastry too. Beautiful story. I felt like I was there with you, foraging like mad for those little figs. You were still able to make the cake (and it looks like it tastes gorgeously) so how you got the figs is aside the point as far as I’m concerned! I’m sure you would have been more agile than me across that gully, my balance is awful. It was real defeat to go to the farm shop, but they were good gigs. Although not as good as the one stolen fruit. Should I coming across to see sunflowers? It was a dreadful straddle, ungracious, stiff and it top it all useless. 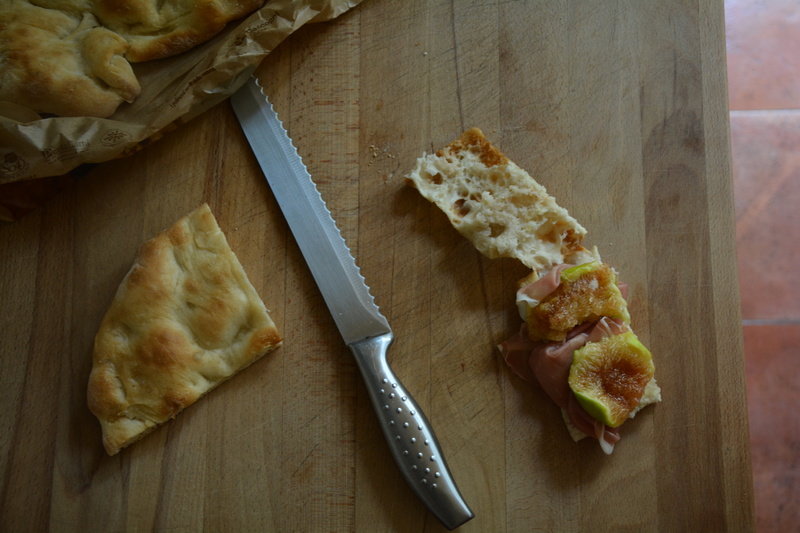 Figs, prosciutto and pizza bianca is one of the nicest, tastiest things I know. Rachel, it was a poor year for pears and plums in Puglia this summer. Figs we had by the bucketload till the thunderstorms came to pelt the trees… I wish I had eaten more, there is nothing like a fresh fig. Now off to eat the last of my mother-in-laws biscotti! Hello Helena, I have been thinking about Pulgia today after reading Catherines post this morning – I am eager to visit again.. Apricots have been scarce too. The few we did have (off a friends tree) were mealy and dry. A biscotti sounds like a small but nice recompense. Wow, figs and almonds sounds a delicious combination. Figs are such a treat but you really do have to get them fresh from the tree or farmshop, don’t you think? I find that by the time they arrive in Rome’s fruttivendoli they’re already weeping unhappily. P.S. Great blog, I really enjoy your writing style. Frankie. I’m not a lover of cooked figs, but I think I could make an exception in this case. It reads as if it has the festive, heady, qualities of a good panforte without the chewiness. Oddly, in our corner of southern France the figs aren’t ripe at all, but we’re in England – Yorkshire, mind – for a week or two, and our neighbours have a tree bowed down by unctously ripe specimens. All very strange. I think you have summed it up perfectly – for fruit, veg, climate and the weather in general, that is : all very strange. It is sort of festive, and yes heady, especially with a glass of something nice. Inspired this post I did dinner last night for friends with a fig in every course – your figs with proscuitto, a fig salad (Ottolenghi) and then your fig tart (and a few other things in between). It was great – I really do give a fig! Thanks! And yes, I absolutely give a fig. Though typically with arugula, the sharper the better, a dusting of blue cheese, and lashings of walnuts (toasted). Though a tart, now, …. Once again, your writing is beautiful. You make that which might be difficult to achieve in the kitchen appear effortless and lovely. I don’t have any figs but I might try this with apricots sitting in my frig. Thank you! Lovely photos! I have never made a tart and your words make me want to be brave and try. Yes yes, be brave and try. I echo Emily’s thoughts…I have never made a tart, and your writing makes me want to craft one now now now (and were it not the wee hour of the night, I would run out to get almonds and mascarpone pronto)…the description of how you form the crust is my favorite part. I have made a tart in the middle of the night, a jam tart, when I was pregnant, it was a disaster but I ate it anyway. Glad to be a tart inspiration. Made this tart with a friend. It’s delicious but overall we found the filling overwhelmingly rich and sweet, so I see why you advise small servings. I think the figs work nicely but nothing beats English cooking apples for contrast to almond-based tart fillings. Pears, granny smiths and raspberries are also terrific but they lack that requisite dynamite sourness. Your fig quest definitely rings a familiar bell with me… I’ve recently arrived in Umbria where I’m staying with an Italian family for just over a month. Yesterday we went over to visit some Italian friends of my host for dinner and, to my delight, they had a fig tree! Only 4 days into my Italian adventure, I had just about learnt enough Italian to enquire whether the figs were ready (evidently hoping this would be followed by a response of “yes, a try one”!) and I was pleased to discover that they were and that I could, but only those higher up the tree as the rest had already been eaten. Dignity and pride thrown aside, I promptly jumped about like a child stretching every limb to reach the nearest fig. A few embarrassing failures later, I had my perfectly ripe fig and it was worth every minute of embarrassment! 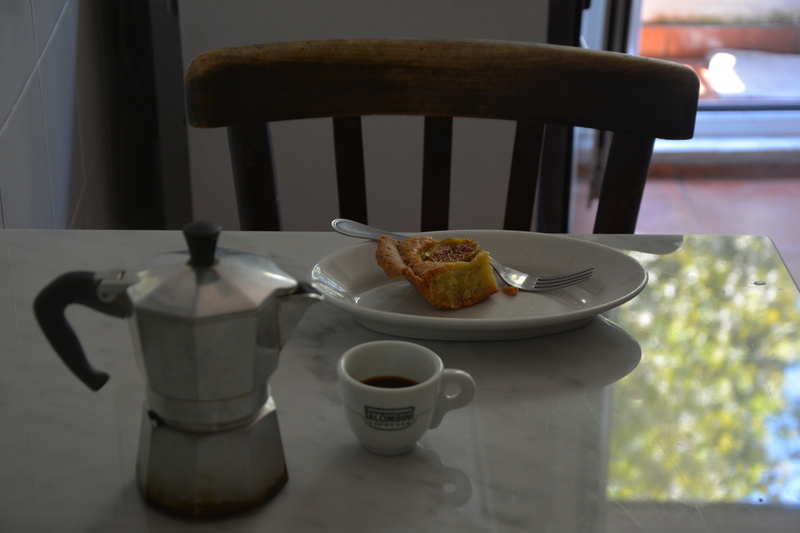 Thank you for your lovely blog, I’m currently blogging about my foodie discoveries in Umbria (www.itstartedwithstrawberries.blogspot.com) and your blog has been a wonderful inspiration.